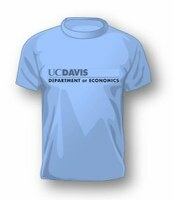 The Economics honors courses are designed to permit students to pursue a program in their major at a level significantly beyond that defined by the normal curriculum. It represents an opportunity for the qualified student to experience aspects of the major that are representative of advanced study in the field. Students must have completed at least 135 units with a minimum grade point average of 3.5 in courses counted toward the major for admission into the honors program. The program will include a seminar and an independent project. Students will meet with the seminar director as a group to discuss research methods and topics. The seminar director will assist students in choosing a thesis topic and will match each student with a faculty advisor who will directly supervise the research. Grading will be on an In-Progress basis and a letter grade will be issued at the completion of Economics 194HB. For more information, please visit Giovanni Peri's website regarding Honors Thesis (http://giovanniperi.ucdavis.edu/honor-thesis.html). The only way students are eligible for ‘high’ or ‘highest’ honors at graduation is if they participate in the department's Honors Program (194HA [Fall] and 194HB [Winter], 4-4 units) for at least two quarters, complete an honors thesis, and meet Letters and Science honors grade point requirement. Honors Program students must take all upper division Economics courses for a letter grade, and cannot have more than eight units of grade I (Incomplete) on their transcript at graduation. Students are not eligible for high or highest honors at graduation unless they participate in this program, but participation in the honors program does not guarantee they will be awarded high or highest honors at graduation. Regular ‘honors’ at graduation is awarded to students who have a grade point average in the top percent of their college (the grade point averages changes from year to year). Graduation with ‘honors’ requires that a student meet the appropriate grade point requirement. Students that meet the grade point requirement are automatically awarded honors by the College of Letters and Science. Questions regarding honors at graduation can be asked at the College of Letters and Sciences Dean’s Office, 200 SSH. Learn about qualifications for academic honors and prizes, including the Dean's Honors List, Graduation Honors, and the Honors Program of the College of Letters and Science, other prizes and awards, and honorary societies.